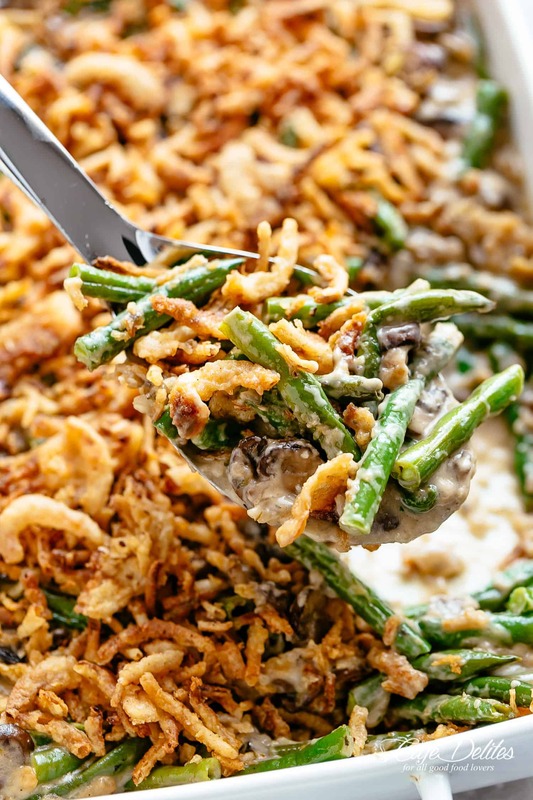 A delicious Green Bean Casserole recipe with homemade cream of mushroom soup and French fried onions! You won’t want canned mushroom soup or beans in your green bean casserole after trying our recipe. Easy to make with fresh green beans…this casserole will be a hit over the holidays! Your Thanksgiving table is just about complete with our Roast Turkey — did you see this green bean casserole in that video? Or choose our Slow Cooker Turkey with Gravy, Mashed Potatoes, Honey Roasted Carrots and Cranberry Sauce! Green Bean Casserole is a family favourite in millions of homes all around America — more so during Thanksgiving. It always makes an appearance on our table as it does with many readers around the States. Why? It’s absolutely delicious with a crispy, crunchy savoury topping, easy to prepare and bake, PLUS the kids love it! 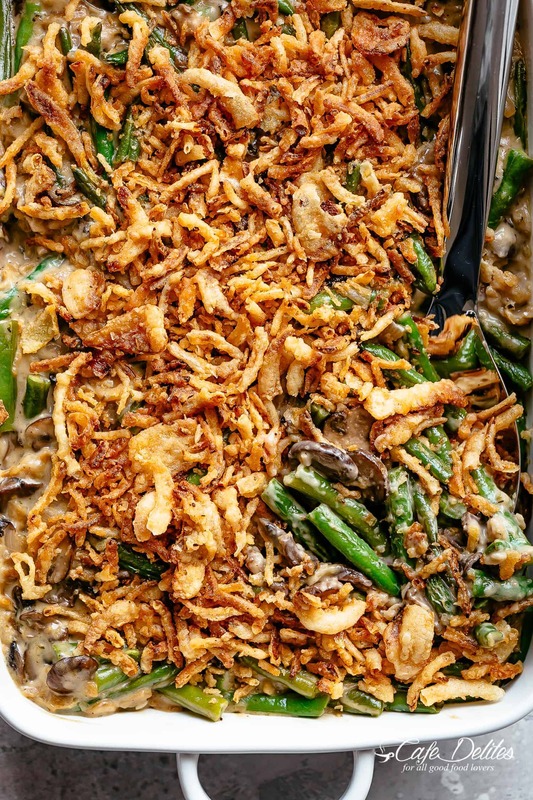 Our green bean casserole recipe gets all of its flavour from the base of this casserole — our cream of mushroom soup recipe. 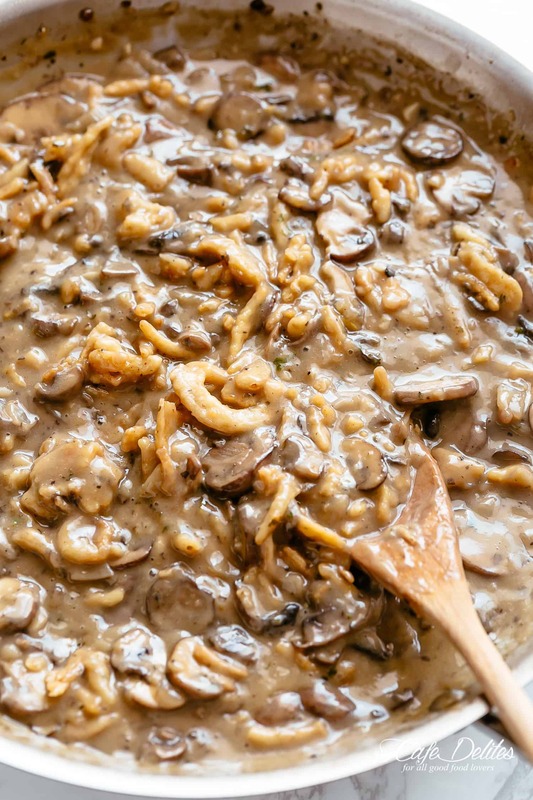 So EASY to make using sliced brown or cremini mushrooms, you can make the soup a day or two before Thanksgiving for faster cooking time on the big day. Make the entire batch of soup, use half for this recipe and freeze the other half for up to a month to enjoy later with leftovers. OR! The mushroom soup included in the recipe box has already been halved for you if you don’t want to make the entire batch. Our soup recipe includes OPTIONAL Marsala wine or Sherry for an even better flavoured casserole! If you don’t want to include the alcohol, there is no need to substitute it with anything. Just ignore it in the recipe and continue with the next step. Green Beans: Fresh or frozen (thawed) green beans can be used for this recipe. You can leave them whole or cut them in half for easier eating (especially for the kids). Some stores sell them already topped and tailed, washed and halved. Check the veggie section of your supermarket! French’s Fried Onion Rings: Included not only for their incredible flavour, but for easier cooking and prep. If you’d like to make your casserole lightened up and completely from scratch, check out our Stove Top Green Bean Casserole! Half of the onions get thrown into the soup once it’s done along with the blanched beans. The other half create the crunchy topping everyone loves. Then BAKE until you see the soup bubbling and the beans are soft and cooked through! Cheese: Add 1/2 cup shredded cheddar, mozzarella or provolone cheese to the soup and top with 1/2 cup extra cheese. Chili: 1/4 cup red or green chilis or jalapeños to add heat! Add more to suit your heat preference! Bacon or Pancetta: Because who doesn’t love bacon? 2 slices pre-cooked and crumbled bacon can be added in with the beans. Herbs: Fresh or dried rosemary, thyme or parsley can be added to the soup. WHO INVENTED GREEN BEAN CASSEROLE ANYWAY? First created in 1955 by Test Kitchen Manager Dorcas Reilly while working at the Campbell Soup Company. 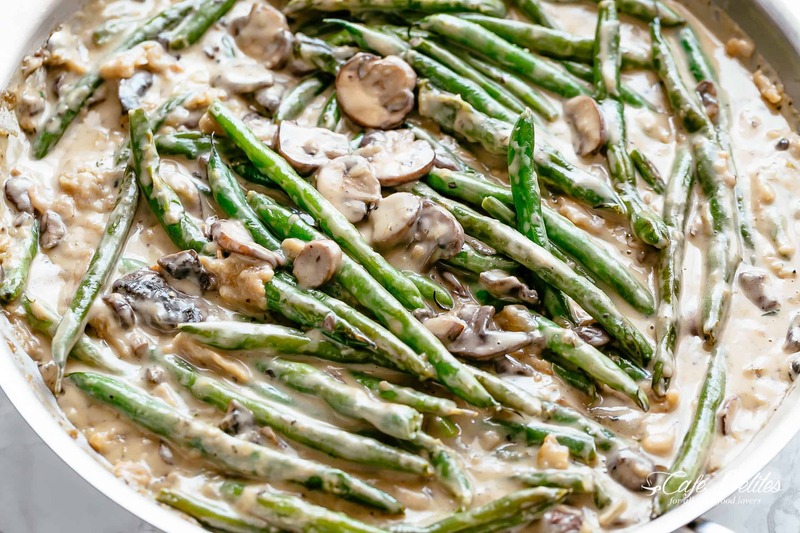 The goal was to create a quick and easy side dish with two ingredients most American households had in their kitchens during that time: green beans and cream of mushroom soup. Green Bean Casserole has since become a household Thanksgiving staple as a side dish for Thanksgiving dinners in America, being cited by many as the ultimate comfort food! Looking for more side dishes? Try these! 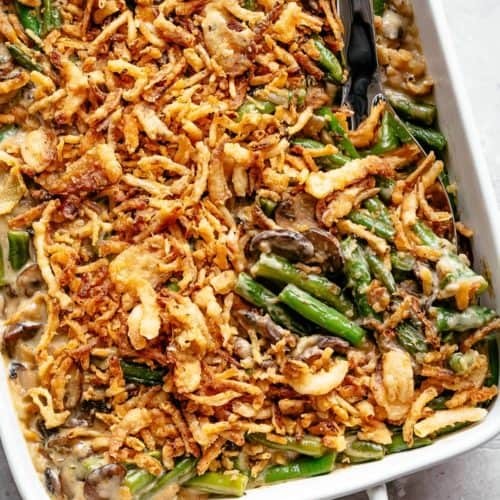 A delicious Green Bean Casserole recipe with homemade cream of mushroom soup and French fried onions! You won't want canned mushroom soup or beans in your green bean casserole after trying our recipe. Easy to make with fresh green beans...this casserole will be a hit over the holidays! Bring 2 quarts (litres) of salted water to the boil in a large pot over medium-high heat. Add beans and boil for about 5 minutes. Drain in a colander and quickly immerse beans in a large bowl of ice water to stop the cooking process. Drain and set aside. Melt the butter in a skillet over medium-high heat. Sauté onion for 2 to 3 minutes until softened. Cook garlic until fragrant, about 1 minute. Add mushrooms and cook for 5 minutes. Pour in wine (if using) and allow to cook for 3 minutes. Sprinkle mushrooms with flour, mix well and cook for 2 minutes. Add the broth and simmer for 2 minutes. Reduce heat to medium-low, season with salt, pepper and crumbled bouillon. Stir in the cream or half and half. Cook until the soup thickens (about 4-5 minutes). Remove from the heat and stir in the cooked green beans with half of the onions. Top with the remaining onions. Bake until bubbling, about 15 minutes. Remove and serve immediately. This recipe does not say what temperature to bake the casserole at. Hi! Instructions twice just say “bake until bubbling”… what temperature?